Grasshopper control is difficult as the grasshoppers are quite mobile. 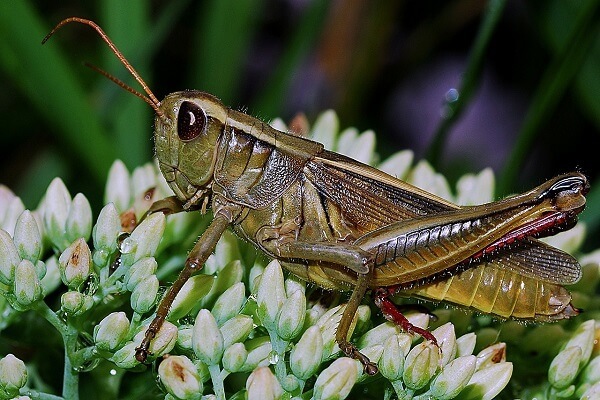 Although some species of grasshoppers do not feed on garden plants, many species do. They eat vegetable plants, flowers, and grass, and most anything. 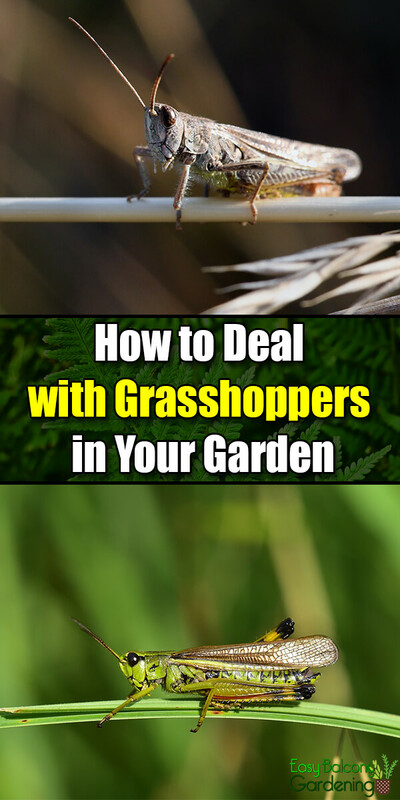 You will observe that your problems with grasshoppers mount in the early summer. Migratory grasshoppers do the most damage to crops. You can do grasshopper control organically. Cleaning your garden of weedy areas, dead crops, dead twigs, etc. can help you control the next season’s grasshoppers. You will also need to prune back your perennials after the first frost hits. Grasshoppers also tend to remain close to the hatching area, as long as they have sufficient food. Trim any ditches or fence rows that can become a habitat for grasshoppers. Cultivate those plants that grasshoppers dislike in the spring, and avoid planting those that grasshoppers like in the late summer. Also, planting “trap crops” can help. For example, you can plant a row of zinnias at the outermost part of your garden, and plant cilantro next row. This method is helpful especially if your garden is next to a field. Controlling grasshoppers are more possible when pointed to the developing stages or early season. Once the grasshoppers have developed such that they could migrate, the control diminishes until completely ineffective. Beneficial protozoan Nosema locustae – a biological grasshopper control. It attacks the grasshoppers at their nymph stage, which is their first metamorphosis. You may know some of these Nosema locustae as Nolo Bait or Semaspore powder. Depending on the infestation, you may need to use other grasshopper control with it as it is very slow acting. However, the long-term effect is very promising: up to 70% reduction under proper conditions. Refrigerate before use. When purchasing, check the expiration date. Cover Crops – peas, sweet clover, etc. If you had grasshopper infestation last season, try control through planting peas early in the season and then sweet clover at the end of the season. Most importantly, these crops will help the nitrogen in the soil. Domestic poultry – assess benefits of grasshopper control against damage done to plants. Natural predators – adult robber files, birds (horned larks, kestrals [small falcons]), blister beetles, coyotes, lizards, praying mantis, rodents, spiders, etc. are natural aids to grasshopper control. Screens – for a plant’s first season, screens can be used as grasshopper control to protect from stunting its growth. It is useless to use fabric screens for grasshopper control, as grasshoppers can chew through most fabrics. Sprays – Rain makes sprays for grasshopper control ineffective. Use caution when applying as most insecticides are not for direct application on fruits and vegetables. Use in May for lower altitudes; June at higher elevations. When you use sprays for grasshopper control, there is no need to cover the whole area as grasshoppers are mobile. The weather – cold, wet climate; very dry winter and spring conditions – can also help with grasshopper control. Look how cute he is… NOT! Some of the insecticides utilized in the control of grasshoppers are Dimilin, Orthene, Sevin, etc, but you need to exercise caution using them. The Dimilin, for instance, is a restricted use insecticide. Make sure you know what you are doing and seek professional help, if necessary. Permethrin has many different trade names, and is widely used for fruits and vegetables. Ask your local garden centers what trade name they carry. Reminder: Grasshopper control is possible even for a beginning gardener if it is done early. Do not wait for grasshopper control until the grasshoppers have developed their ability to migrate. For most effective grasshopper control, it should be treated as a community project. You can talk to your neighbors and make a plan on grasshopper control.